Our group has expertise in synthetic organic chemistry, and in particular carbohydrate chemistry. Techniques used by our group include NMR, UV/Vis spectroscopy, MS, X-ray crystallography, and HPLC. Glycoside hydrolases (glycosidases) are enzymes that catalyze the hydrolysis of the glycosidic bond, which is important in energy mobilization and controlling the so-called ‘glycocode’, the way in which carbohydrates encode biological information for cellular recognition processes. In our group we are interested in understanding how diverse glycosidases operate at a molecular level, i.e. their mechanism of catalysis. Our laboratory designs and synthesizes novel substrates and inhibitors, and we use these to help define the role of active site residues in the catalytic mechanism of these processing enzymes by X-ray crystallography and biochemical techniques in collaboration with structural biologists and use computational analysis and theory to interpret the results to provide unified models of catalysis. 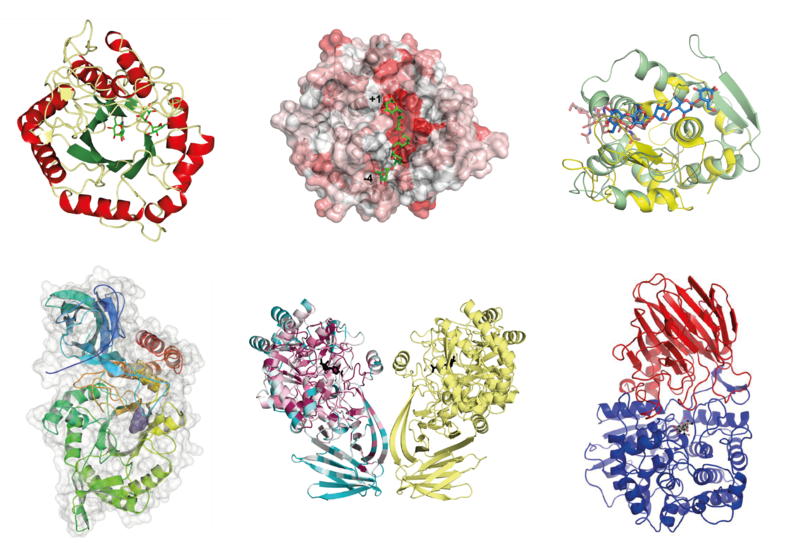 One group of glycosidases we are studying are involved in the processing of carbohydrates attached to proteins (so-called glycoproteins), which is essential for the ability of glycoproteins to achieve their folded and active states. Another group of enzymes that we study are those that cleave high-volume raw carbohydrate feedstocks of potential interest in biofuels production, and which could contribute to reducing fossil carbon emissions. A new interest in the group is the process of sulfoglycolysis, which involves the degradation of the organosugar sulfoquinovose, liberating its carbon and sulfur as part of the biogeochemical cycle. Our studies are conducted in collaboration with X-ray crystallographers (in particular Prof Gideon Davies, UK), theoreticians (Prof Carme Rovira, Spain), and biochemists. Examples of β-glycosidase inhibitors synthesized in the group. Examples of α-glycosidase inhibitors synthesized in the group. Glycoside hydrolases studied in the group. Top: left, GH99 endo-α-1,2-mannosidase; middle, GH76 endo-α-1,6-mannanase; right, GH134 endo-β-mannanase. Bottom: left, GH123 N-acetyl-β-galactosaminidase; middle, GH31 sulfoquinovosidase; right, GH92 α-mannosidase. A wide range of microbes have the ability to colonize our bodies, causing disease or acting as commensals (e.g. our gut microbiota). Our immune system plays an important part in combating infection and limiting the environment that can be colonized. One mechanism through which this is achieved is through recognition of microbe-specific glycolipids by the innate immune system, acting as ‘pathogen associated molecular patterns’ and ‘microbe-associated molecular patterns’. Such glycolipids interact with cell-surface signalling proteins such as the C-type lectin receptor Mincle, or are presented on antigen presenting molecules of the CD1 system to T cells. Our group has synthesised a range of glycolipids from pathogens (Mycobacterium spp., Streptococcus pneumoniae, Malassezia spp.) and commensals (e.g. Lactobacillus plantarum) and have used these to illuminate previously unappreciated aspects of their biosynthesis and immunology. Such compounds have potential to be used in antigen therapy against cancer, and as adjuvants to help prime the immune system for vaccine therapies. These studies are conducted in collaborations with immunologists (Prof Dale Godfrey, Prof Jamie Rossjohn, Melbourne; Prof Sho Yamasaki, Japan). Glycolipid-based natural products synthesized in the group. We have conducted a range of medicinal chemistry projects. Typically, these projects are conducted with a commercial focus and are not available for students to work on owing to the limited opportunities to present the work publicly, and the restrictions on funding and intellectual property. Some of our projects that have led to publications are summarized below. Drugs developed in the group.